Prolimatech, the master of cooling is going a step further after the success of the Prolimatech Megahalems by presenting another revolution in CPU cooling with the limited edition Prolimatech Black Series Genesis. Besides the immaculate quality - which is present across their entire product line-up - the Black Genesis sets new standards in cooling capability and cool looks. Prolimatech continues the trend set by the Megahalems and Super Mega by utilising two separate towers, but instead of placing them next to each other, they have been rearranged for maximum performance. 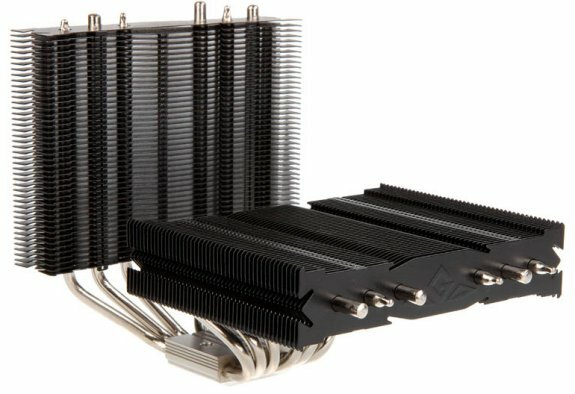 The large array of cooling fins can hold up to three 120 or 140 mm fans, two of which can be installed right out of the box with the included mounting materials. Besides keeping the CPU cool, the construction allows for direct air flow across critical areas like the memory and power phases of the system. Due to the innovative construction, Prolimatech manages to raise the bar and cool down the CPU even more. Adding to the excellent performance, Prolimatech has included additional black mounting screws to add further contact pressure, which translates into even lower operational temperatures. The use of these screws is intended for experienced users, which aim to get the most out of the cooling solution, as the pressure surpasses the Intel specifications. Overclockers will be happy to hear that Prolimatech continues the trend and allows for complete choice of fans, as none are supplied with the cooler. This enables every user, regardless of their preferences or needs, to select the right models to equip the Black Genesis. Even when only using a single 120 or 140 mm fan, the Black Genesis manages to cool the CPU and keep the noise level at a minimum. The Prolimatech Black Genesis also features broad compatibility as it ships with an AMD mounting kit intended for all modern sockets like AM2, AM2+ and AM3. Intel users will also be able to mount the cooler with the included kit for Socket 775, 1155, 1156, 1366 and 2011. To enable the most efficient transfer of heat between the CPU and Black Genesis cooler, Prolimatech supplies their high-performance PK-1 thermal paste, while a sturdy backplate guarantees a stable hold, taking the strain off the mainboard and socket. The Prolimatech Black Series Genesis is available for pre-order with a price tag of £59.90 exclusively at www.overclockers.co.uk.